Hey y'all. Happy Leap Day! I will jump right in. I didn't weigh last week. I lost a very good friend and I have said what I needed to say about that I think and now I am just left with missing him. I didn't respond well to the grief and ate everything in sight. I'm trying to get back to normal. I'm cleansing with water and my goal is to not drink or go crazy with food. I'm taking it easy on myself this week but also trying to stay in line. Last night was a fun night with my friend Jordan as we watched the Oscars and Leo FINALLY won an Oscar. I was happy for him and I always enjoy hanging with Jordan and watching the Academy Awards. I thought the show was a little boring this year but Lady Gaga was amazing, I was happy for Leo and there were a couple other interesting moments. 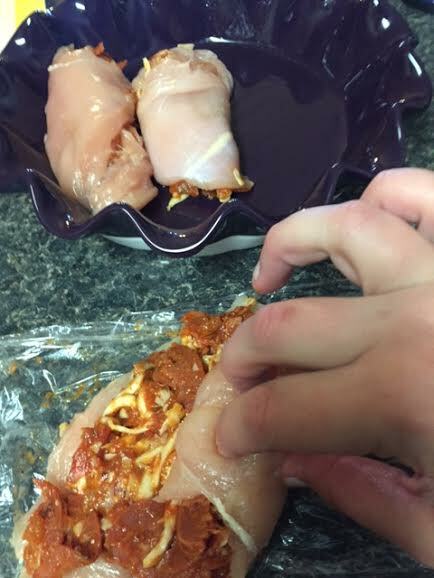 A couple weeks ago, I made Pizza Stuffed Chicken. Usually, if a recipe contains more than one or two steps, I skip it. I have seen a lot of recipes for stuffed chicken but I've never done it because I'm lazy. 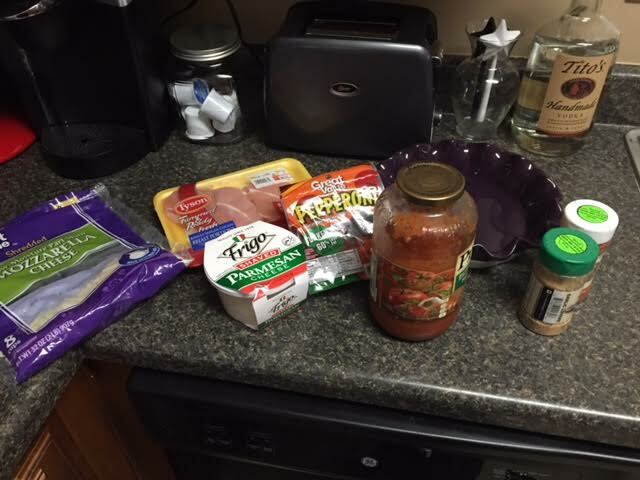 I saw the recipe for Pizza Stuffed Chicken and thought I'd give it a try. The original recipe calls for full fat ingredients but I lightened it up a bit. 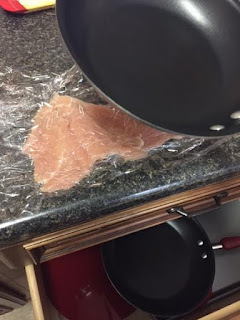 I took the chicken breasts, butterflied them by cutting them in half. I didn't go all the way through the chicken and I was able to split them open like a book. After that, I pounded them with a skillet to thin them about a bit. This was fun. 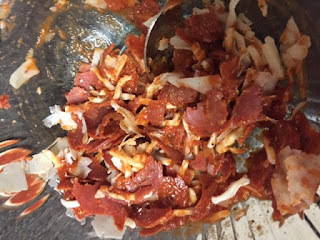 I made a mixture of turkey pepperoni (which I highly recommend as a tasty alternative to regular, fatty pepperoni), lower fat mozzarella cheese, garlic and spices and spaghetti sauce. I used the kind in a jar but you can get fancier if you want. 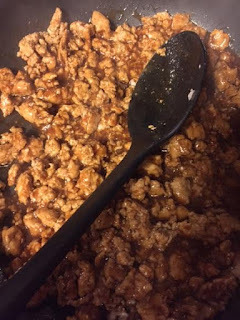 I placed the mixture on the flattened chicken, rolled it up and threw it in a dish that I sprayed with Pam. The recipe called for oil on the bottom but it didn't need it. I covered the chicken in marinara, light cheese and topped it with a few more pepperonis. 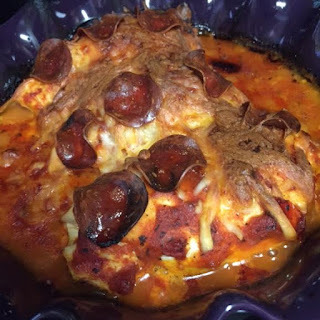 I popped it in the oven for around 45 minutes and even though the cheese got burned and it's not that pretty, it was delicious! The chicken was so tender and the pizza flavor added a nice touch. 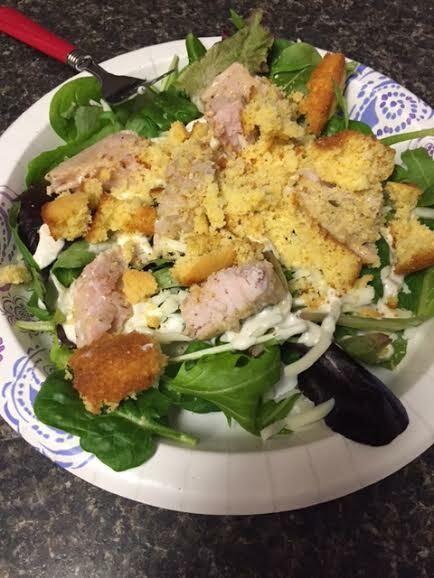 I served it with a side salad. It wasn't so bad stuffing chicken and I may actually do it again. I have to brag on Ian. He doesn't cook much and in fact, he hadn't really cooked for me since we had been together. Since the past couple weeks have been insane, I asked him to help me to cook dinner while I worked out. He looked scared at first but it was taco night. I told him all he had to do was cook and season the meat. When I got home, he had done a perfect job. Honestly, he broke up the meet even better than I do. He even went so far as to create a little assembly line because he wanted it to be "cute" for me. 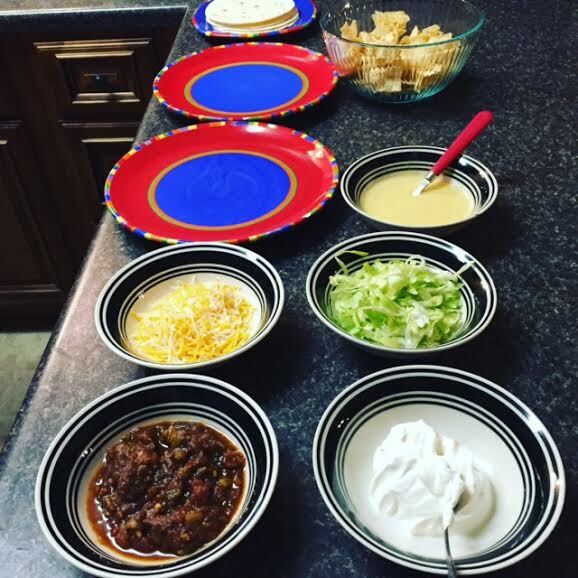 He is pretty much in charge of taco night. I knew he could do it. Just as an aside, I can't WAIT FOR SPRING BREAK! Happy Oscar Sunday, y'all! For many, the Oscars mean nothing but for Jordan and I, they are special. We have a tradition of watching the movies and then watching the Oscars together while we feast on our favorite junk foods. This year, Jordan has once again watched everything nominated in major categories but because my schedule has been ridiculous and honestly because I dropped the ball a little I haven't seen all of them. I was able to watch every movie nominated for best picture though so I'm happy with that. I don't have a ton of time to go over each movie but I did want to give my two cents in case anyone cared. 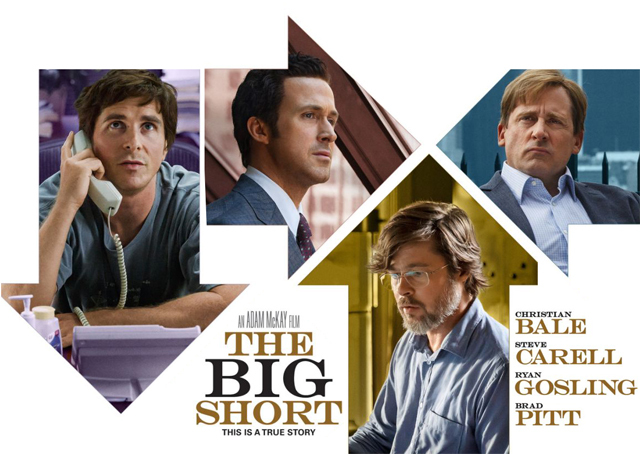 The first movie is The Big Short. This is a movie about the housing market crash in 2008. It has some huge stars like Christian Bale, Brad Pitt and Steve Carell. I really liked the movie. It was a bit long but the actors in it were amazing and it provided smart insight to the world of economics which I know nothing about in an entertaining way. I think my favorite part was the fact that Ryan Gosling's character narrated it and spoke directly to the audience. He even did these breakaways where celebrities that were unrelated to the movie would have a scene in which all they did was explain complicated economic theories to the camera and then they would resume the movie. I had never seen that before but I decided I liked it. It was cool to get an explanation from Selena Gomez one scene and then Margot Robbie in another. I think all nominations are deserved. 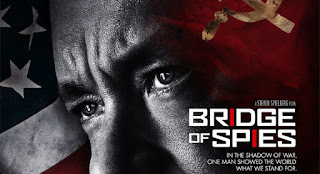 The second movie is Bridge of Spies. 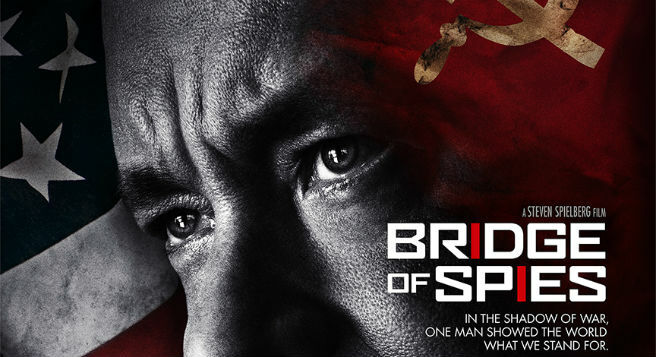 This is a Spielberg/Hanks production so in theory, it should be the best thing since sliced bread. Good: yes. Life changing: No. The story is interesting and the tension is solid for most of the movie but I found it to be a bit slow and underwhelming. I also thought there were some weird plot holes. It seemed like a couple of things were brewing but never did. I was also super annoyed that everyone spent the entire movie blowing their nose. I get it; it was cold but maybe they could have saved me 20 minutes. The third movie is Brooklyn. Y'all, this is my favorite movie of the bunch BY FAR. It doesn't have a snowball's chance in hell of winning but it is probably the only one I feel an urgent need to own. It's a love story intermingled with the complex struggle of Irish immigration to America. This particular movie is set in the early 50s but I think the topic can be applied today as well. She was in search of the American Dream. It wasn't a perfect movie but It gave me the feels and it's one I wanted to watch again before I even got done watching the others. 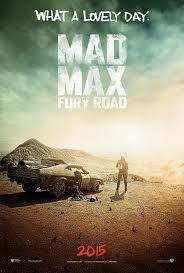 Fourth we have, Mad Max: Fury Road. I feel like someone else is better suited to talk about this movie. It's shot well, it's cool that women roles were prominent but I'll be honest, I didn't enjoy a single second of the movie. It just isn't my kind of film. I know several people that loved it but I didn't. That's all I will say. 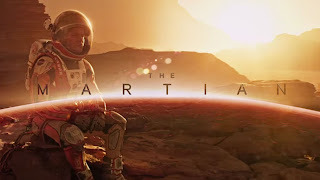 The fifth movie is The Martian. I thought this was a fun and interesting movie. It's certainly in the top tier of the bunch this year. Matt Damon is great and the science of the movie is fascinating. It looks amazing too. The climax of the movie seems a bit far-fetched but not enough to hurt it. Not the best space movie in recent years (I think Interstellar was mind-blowing) but not the worst (not a Gravity fan). 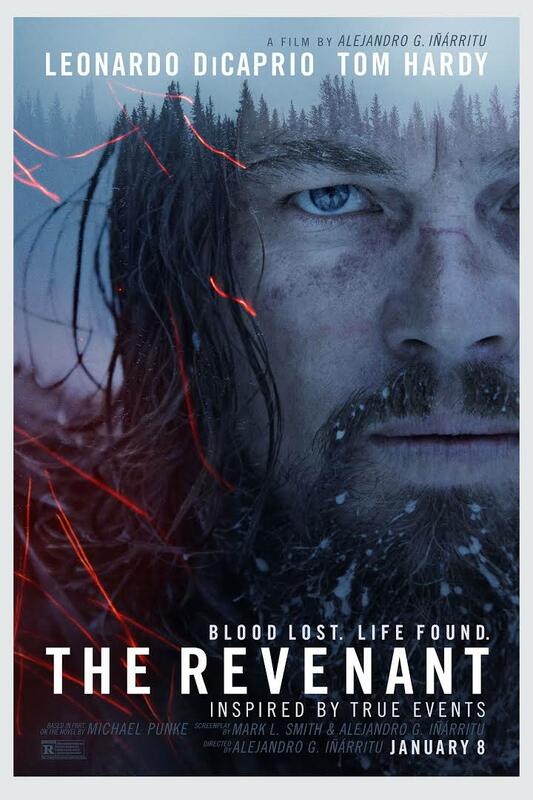 Sixth is The Revenant. I should mention that I've been in love with Leonoardo DiCaprio for over half my life so maybe I'm a bit biased but if he doesn't win this year, I will more than likely set something on fire. This guy bit into a beef liver and crawled inside a horse cavity just to entertain you people. Also, he totes cares about the environment. 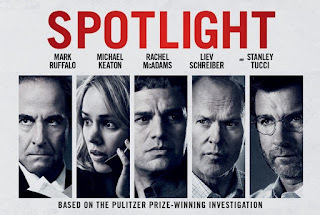 I can honestly say I will probably never watch the movie again because it's too intense, heartbreaking and gross but it was kind of incredible. Beautifully shot. Great acting. Nice historical storytelling. I got a bit stressed when thinking about how he got down from this one cliff and also how he went from having a dead, broken foot to walking around like he owned the joint but that's the only place where I felt they could have done a better job. The bear scene is incredibly realistic and disturbing. 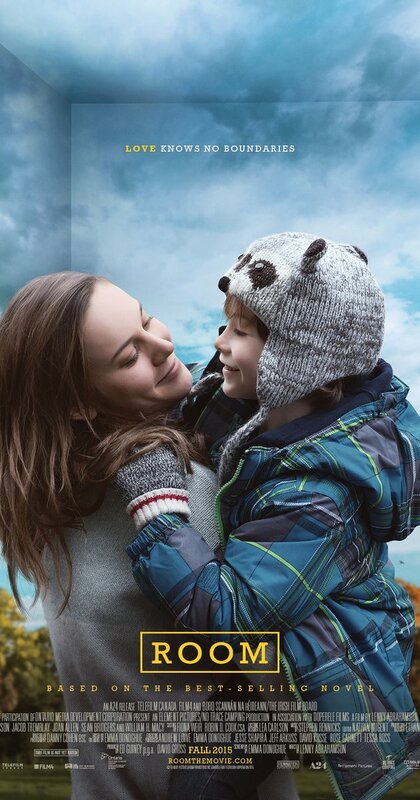 The seventh movie is Room. I would say this is probably my second favorite movie. It's beautifully done and better than I expected. The first 75% of the movie is so tense. I was anxious most of the time. I think the kid should have been nominated as well. I think the only part that could have been better is the role played by William H. Macy. It was a bit underdeveloped. 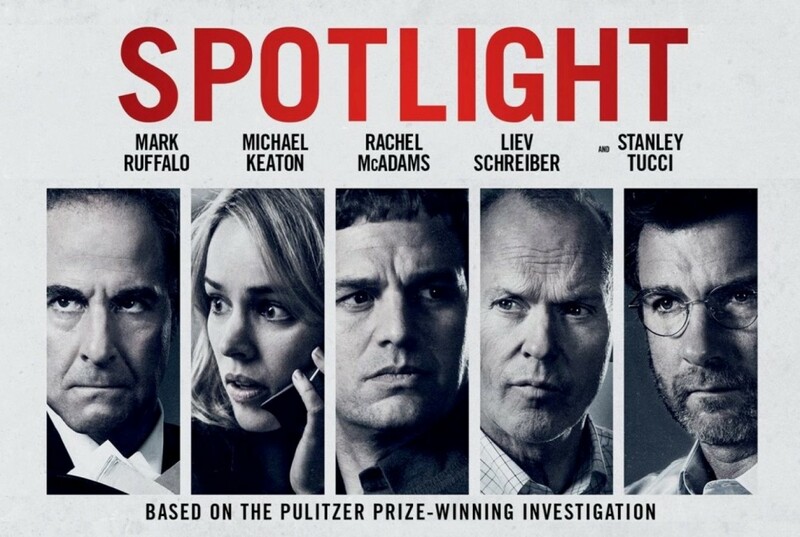 Finally, the movie Spotlight. I don't see me ever watching this one again either because I don't typically want to casually watch movies about child molestation but it was a really solid movie. The acting was great and it was interesting to see all the hard work that should go into journalistic reporting. It was so revealing and upsetting in terms of what the lengths the Catholic church went to to hide these horrible acts and then to imagine what the children went through. I was able to catch a few other movies from the list that weren't just nominated for best picture. I saw The Hateful Eight. Jennifer Jason Leigh is nominated for Best Supporting Actress. This was a classic Tarantino movie but it was a bit gratuitous without the merit that only a few movies of his have. I wasn't a fan. I also saw Straight Outta Compton which was fantastic. I think it got completely robbed and I truly hope that the Oscars fulfill their promise to become more diverse and I also hope that Hollywood starts giving acting roles to deserving actors regardless of race. I haven't seen Creed but I have a feeling Michael B. Jordan was robbed as well. I saw Joy. As much as I love Jennifer Lawrence and Bradley Cooper with Robert DeNiro thrown in the mix, this movie was just OK. I loved that it featured QVC but it was slow and the characters were flat and annoying. Finally I saw Inside Out. This was an animated film for kids with adult ideas about the way in which we think. I loved it. I'm super disappointed that I didn't get to watch The Danish Girl, Steve Jobs, Trumbo and Carol but I plan on watching them soon. 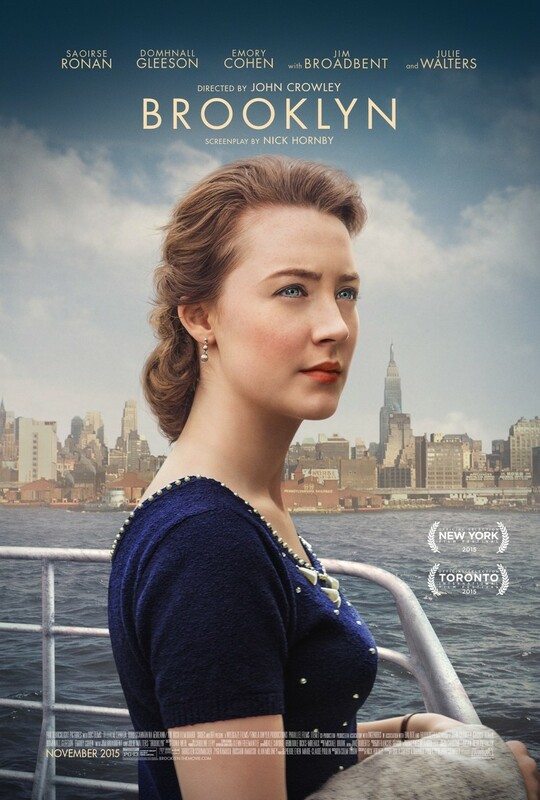 Based on what I've seen and liked, my favorite movie: Brooklyn. 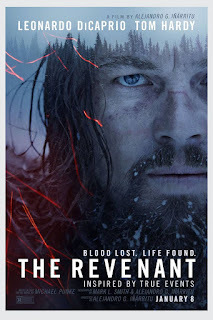 Actor: Leonardo DiCaprio. Actress: Brie Larson. 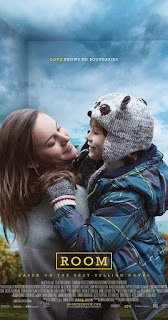 Best Director: Lenny Abrahamson. Supporting Actor: Christian Bale. Supporting Actress: Rachel McAdams. (I haven't seen several of the movies in these categories so it's not really a fair assessment. I'm not great at predictions so I won't make any here but I'll let you know if there are any life changing movies I notice after I watch the rest of them. Hey y'all! I hope you are all having a tolerable Monday. I wanted to begin the post by asking for good vibes/prayers for my friend David Earp. He has been moved to hospice care. I am hoping for him to have peace. He is one of those people who loves to take care of folks...welcome them in. Everyone loves him to pieces and I am just hoping for the best. Cheers to you David! 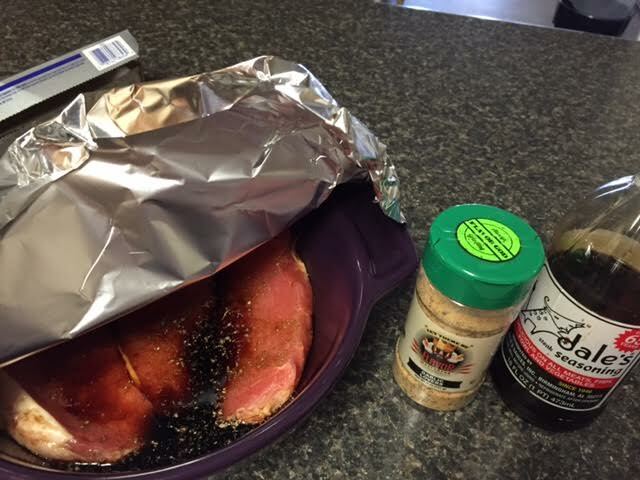 It seems silly to now switch to whining about my weight and giving you a pork chop recipe but I'm going to try. 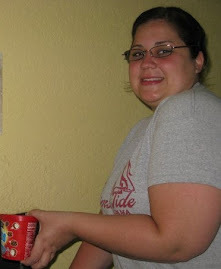 I was actually down a couple ounces when I weighed this week. I was impressed with this mostly because last week I really focused more on eating when I was hungry and stopping when I was full and less on calorie counting. It was a bit terrifying but also liberating. I ate a couple of naughty things but I didn't binge and I ate healthy most of the time. Once again though, I struggled on the weekend. I really only ate too much last night and I felt sick. I'm going to try this again this week. I want to be normal and as unlikely as it is for ME to ever be NORMAL, I'm not going to stop trying. 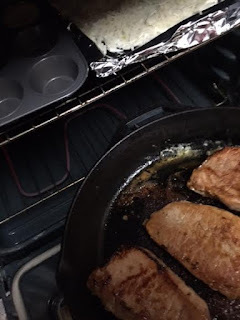 I made pork chops two ways last week so we could have leftovers. 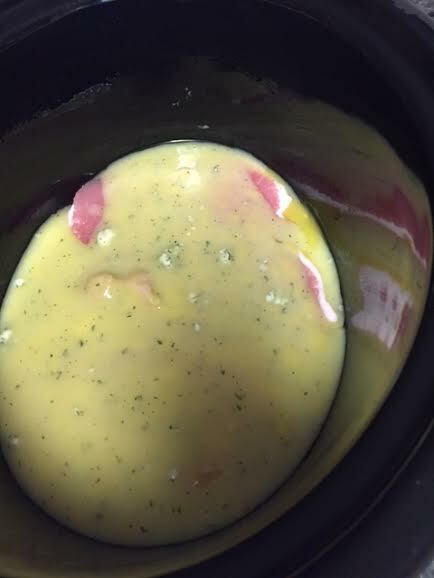 The first way was in the crock pot. I got this recipe from Pinterest. 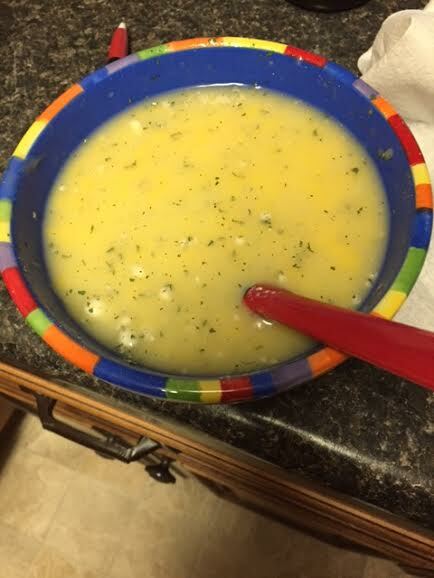 You mix together a can of cream of chicken soup and ranch dressing mix. 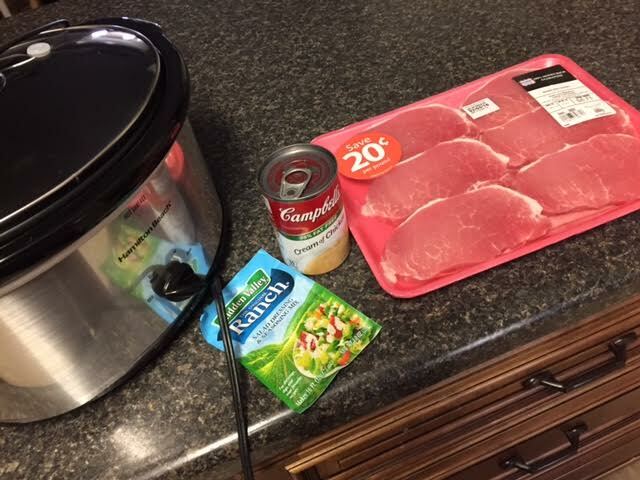 Pour half the mixture into the crockpot, add the pork chops, top them with the rest of the mixture and cook them on low for about 4 hours. 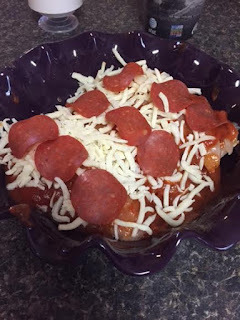 This isn't a "clean" (nor is it pretty) recipe but it's really easy. I am such a fan of crock pot dinners that require little effort. The soup and the ranch didn't provide as much flavor as I would have liked but the pork chops were SUPER moist and tender. My favorite part was that I used it chopped in a salad with cheese and leftover cornbread that I made and THAT WAS DELICIOUS. 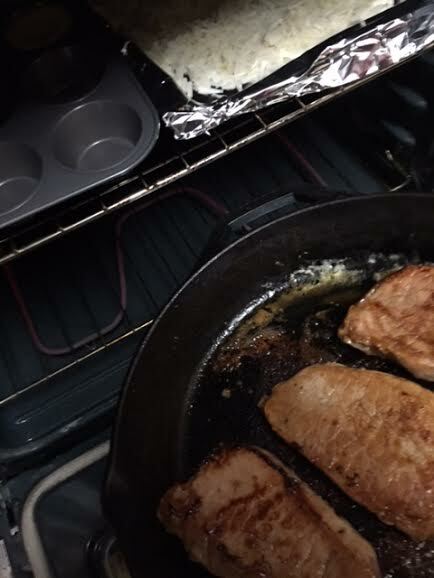 The other way I made the pork chops was by marinating them in Dale's (Ian is obsessed with this marinade) and spices and then cooking them in the cast iron skillet. 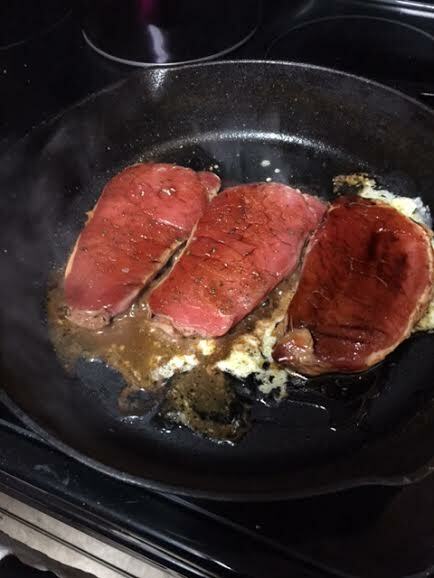 I put a bit of oil in the pan, got it really hot and seared them on each side then I popped them in the oven to finish them. 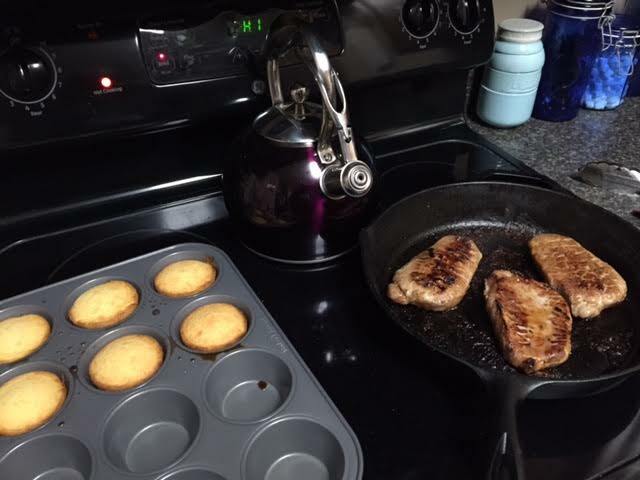 These weren't quite as tender and because pork is already salty and I marinated them in Dale's, I thought they were a bit too salty. I enjoyed them still though and Ian LOVED this version. 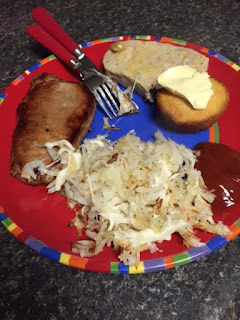 I served everything with baked hash browns and corn bread. Hey y'all. It has been a cold, dreary Monday in Tuscaloosa. I hear there was an epic rainbow though so at least Mother Nature ended the storm with something pretty. I was none too pleased with the number on the scale this week. 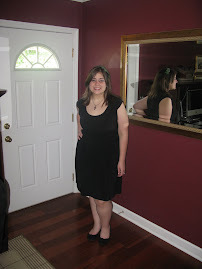 I did really well and gained 3.5 pounds. That's not a couple ounces y'all, that's a big gain and it's frustrating. I feel like a broken record at this point but whatever. This week is a new week I guess. I didn't grow up in a Manwich family. If my mom made Sloppy Joes, they were from scratch. It's not something that we had a lot of though. I enjoy them but when it comes to the weeknights, I'm incredibly lazy and there isn't a single part of me that wants to spend a lot of time on dinner. 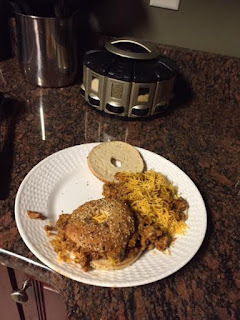 Last week, I made a version of Sloppy Joes that Sloppy Joe enthusiasts (if there are any out there) would call an imposter but I don't care. It was delicious. 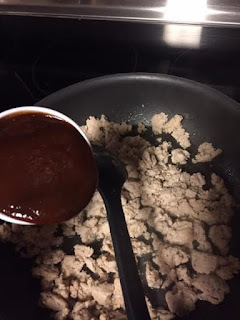 I cooked up some ground chicken in a pan, added barbecue sauce and called it a day. 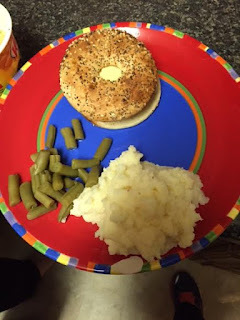 I sprinkled some cheese on it and used my toasted Everything bagel bun and if I had let myself, I would have eaten the whole pan (there's a chance I did but I cannot recall and nobody can prove anything). 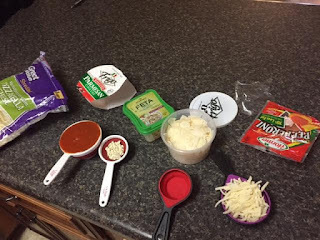 The sweetness of the sauce combined with the saltiness of the cheese and bread made for a perfect, quick and easy dinner! 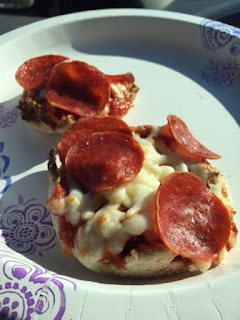 Also, I lamented about my eggplant pizzas last week. 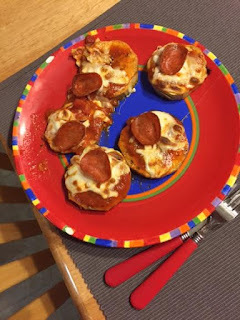 My mom reminded me that light English muffins also make a good vessel for pepperoni and cheese so I threw that together this week with much more success. Of course, eggplant is healthier than bread but I'd rather have two small, filling pizzas than several eggplant pizzas that I don't like. I had a lovely Valentine's Day picnic with Ian yesterday at the Natural Bridge in Alabama. I hope that your Valentine's Day was full of love or chocolate or something pleasant. Have a great week. Happy Monday, y'all. If you're like me, you stayed up a bit past your typical Sunday bed time to watch Peyton Manning and his Denver Broncos win the Super Bowl. As usual, the temptation of yummy game day food was too much for me to handle. Of course, I ate too much. This past week was fairly successful in terms of cooking and attempting to eat right. I made chili again and even used it for low fat chili dogs which was delicious. I made a couple other recipes as well. Like always though, my will power faltered on the weekend. My weight was the same as last week give or take a couple ounces. My goal is of course to lose some weight but my ultimate goal is to find the will power to stop binging on the weekends and to once again be happy with my body and who I am. If I don't meet that goal, the weight won't come off. 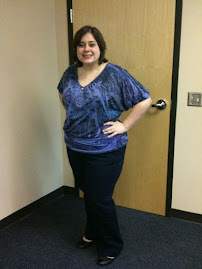 I tried on a few pairs of jeans yesterday because the jeans I usually wear were in the laundry. 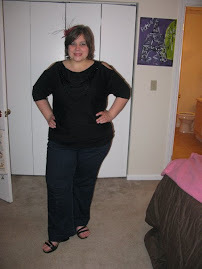 Not one of my jeans fit...that was super depressing but totally expected. Sigh. 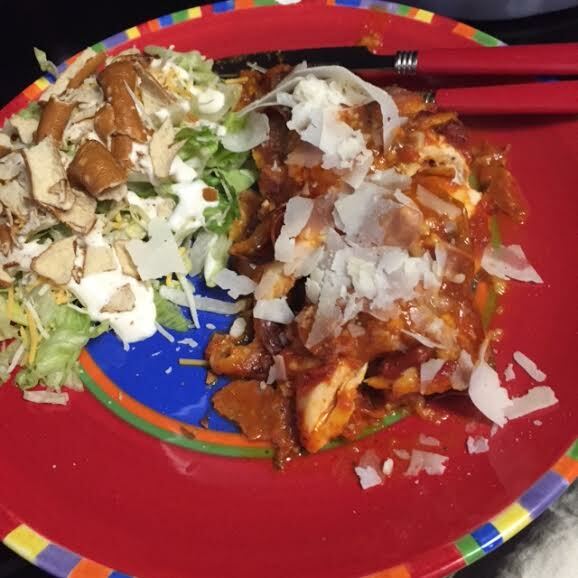 As I said, the week started off pretty good in terms of making healthier food. I bought an eggplant for the first time (at least that I remember) and used it to make tiny pizzas. I sliced the eggplant into circles, popped it in the oven with salt and pepper sprinkled on top for a few minutes before adding toppings. The goal was to cook the eggplant as much as possible so the texture would be good. I got it out of the oven, added some spaghetti sauce, low fat herbed feta cheese, low fat mozzarella and parmesan cheese. 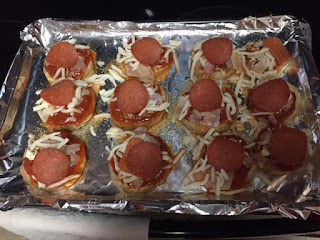 I also added a slice of turkey pepperoni to each one. 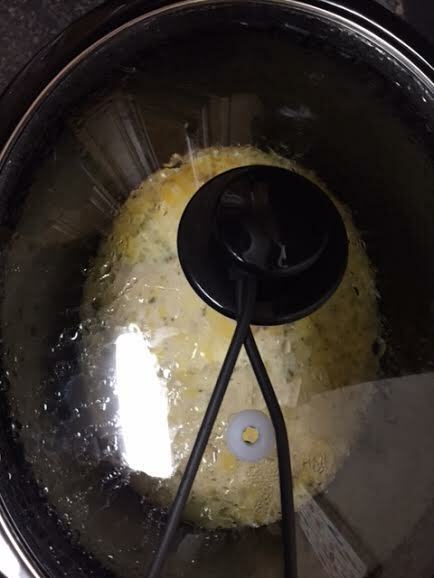 I put it under the broiler for a few minutes to get the cheese all bubbly and brown. The top of the pizzas were delicious but I learned something about eggplant this week. I learned that unless it's sliced very thin, battered and fried and smothered in cheese placed on top of pasta, that I don't like it. I feel like that could have been a run on sentence but I don't care. The texture was not good and it tasted a bit like pumpkin to me and I was not a fan of that flavor combined with pizza. I championed on eating it as long as I could but decided that I didn't like it all. I ate the tops off of them and called it a day which probably defeated the purpose. One thing that I considered a success this week was a different version of my Diet Coke cake. 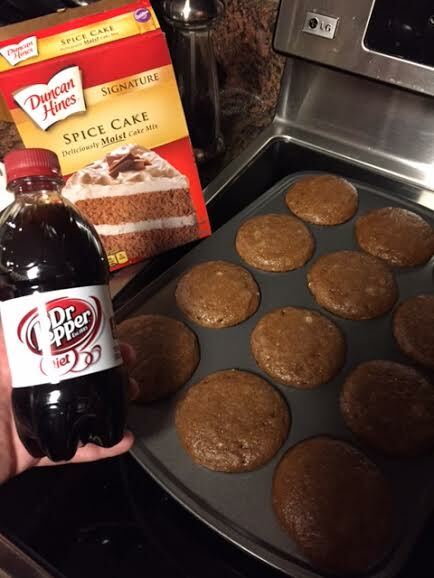 I made cupcakes by combining a box of spice cake with a bottle of diet Dr. Pepper. 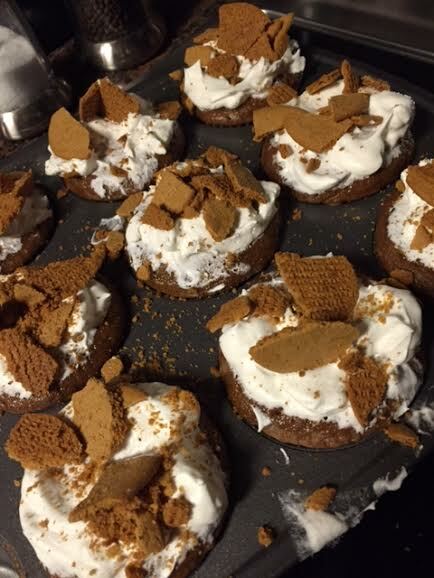 The best part about these was that I decided to top them with Lite Cool Whip and one crushed up ginger snap from World Market. The total calorie count for these was 190 calories per cupcake. They were huge so I felt like I got a lot for 190 calories, especially for cake. The one thing that I would do differently is that I wouldn't put the topping on all of them at once, I would add it to each one as I wanted to eat it because the ginger snaps got a little soggy. Other than that, they were moist and delicious. There was a slight diet-y aftertaste but a win for the most part. 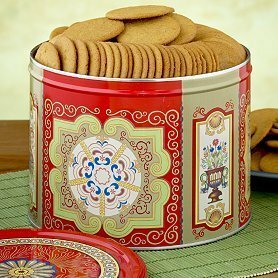 As you may have guessed from my last recipe, I'm in the mood to get rid of the ginger snaps I bought from World Market before Christmas. 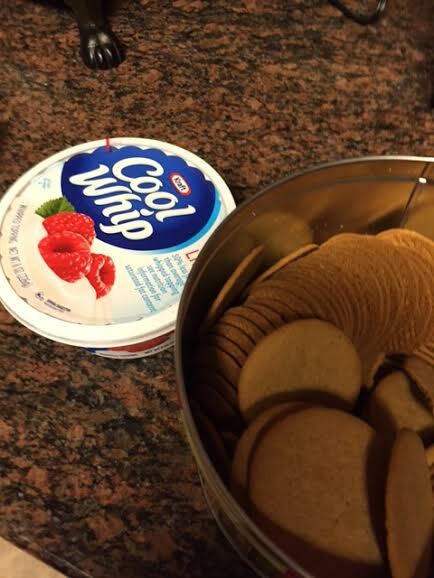 I love them but you get a huge tin of them so I'm trying to find ways to get them out of my house before they go bad. 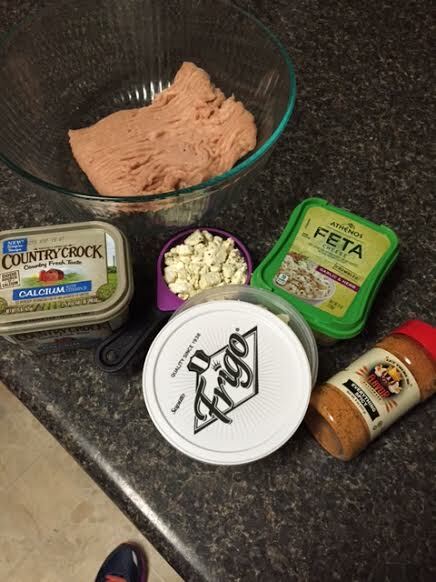 One thing I have taken to doing is to mix them with yogurt. They are only 20 calories a piece so adding a crushed up snap to your yogurt gives it a nice crunch. 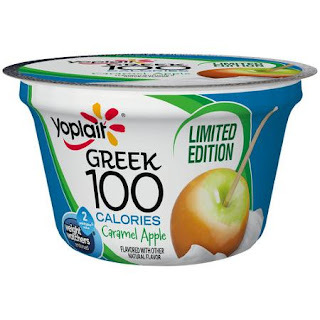 I'm not a huge fan of yogurt but when you add a bit of texture, I like it a lot better. I've been enjoying the new caramel apple flavor and it pairs nicely with the ginger snaps. Happy early Valentine's Day to everyone out there! Happy February y'all! 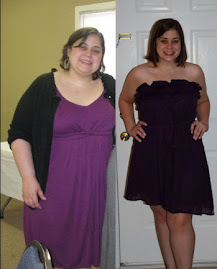 I will jump right in by saying I was up just a bit from last week on the scale but I fully anticipated this as I was recovering from a nasty stomach bug. To be honest, my stomach is still all haywire. I'm not really sure what's wrong with me but I'm also not making many strides to solve the issue other than over the counter nurturing. I was ravenous last week for some reason so I'm hoping to reel that in a bit for this week. As an update, I decided not to do the half marathon this year. I had high hopes but as my 9 mile run loomed last week I couldn't think of anything I would rather not do more than that long run. Since I have run it before, my goal was to beat the time I had in 2013. At this point, about 6 weeks from the race, my pace is almost 4 minutes slower than what I was running then so I don't think it's physically possible to shave off enough time to beat my time from 2013. 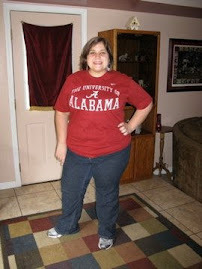 I am still going to run and walk 15 miles on foot each week but focus more on my food intake than training for a race. Plus the race would have cost me $70 and right now, that feels like an investment. 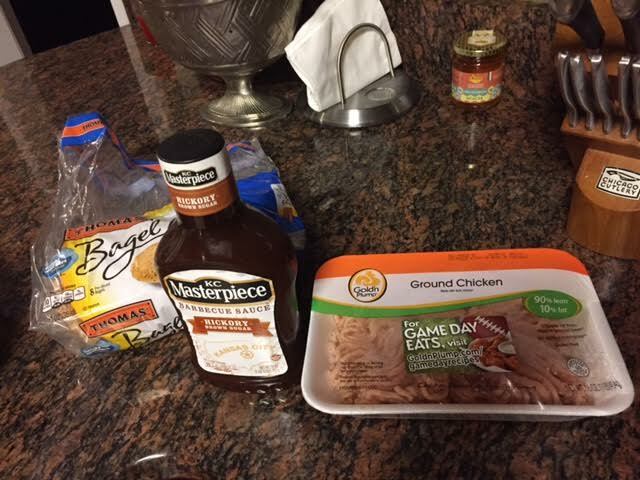 I think I have mentioned my love for the versatile meat that is ground chicken. 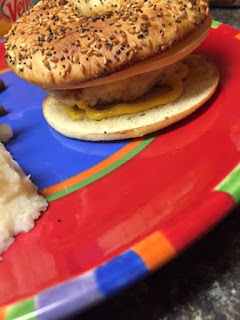 This week, I wanted to show you how delicious a chicken burger can be. 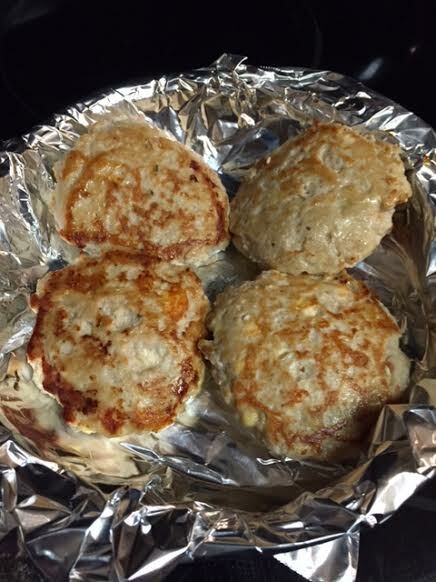 Because you will need to add a bit of fat to make sure the burger is chicken, I put a bit of margarine in the skillet and added some herb-y feta cheese and parmesan to the meat to make it moist and tasty. I also threw in some Flavor God seasoning. I added smoked gouda to the top of the burger when it was done (low and slow in the skillet) and put it on an Everything Bagel Thin. It was DELICIOUS! I made sure to snag the ingredients to make it again this month because all the flavors combined with the chicken and added to the bread with all the seeds made for a delicious burger. I even made it into a wrap the next day with the leftovers which was also delicious. I wanted to give a warning about Burger King's Chicken Burger. Some may argue that it's obvious to avoid a chicken burger from Burger King but I always try to eat fast food attempts at having more lean options so I gave it a try. First, it looks nothing like the picture. 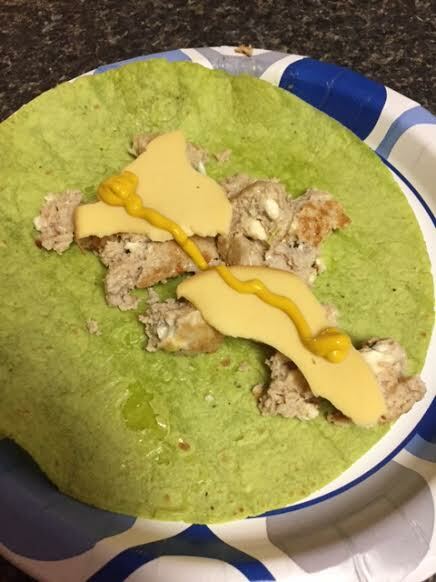 I got with cheese but without mayo, tomato and pickle. It was old and flat. The burger itself tasted so processed that it was barely edible. I am not one who is too particular about processed foods but the flavor made it taste like a frozen patty that can be found on sale at Wal-Mart. I most definitely do not recommend eating it. Not only is it not good, you can get a regular burger from a place like Milo's for less the calories and it's delicious. 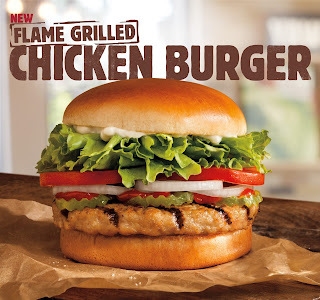 As someone who loves fast food and is kind of an addict at times, I give this a huge thumbs down. I hope you all have a great week! Safe travels to Nish and Eliott on their trip to Italy and a continued request for prayers for my friend David Earp who is still in the hospital.